As a read aloud I'd say this is appropriate for any group! Some of the vocabulary is a little advanced though, so independent readers might find it tricky. As an independent read I'd put it somewhere around 2nd or 3rd grade level. Dagmar is not like other vampires. He's shy, he's afraid of humans, and . . . he's a vegetarian! But even more than he likes vegetables, Dagmar loves candy. And when he hears about all the treats he can get on Halloween, he knows he has to be brave and venture out into the human world. A wonderful new book from the author and illustrator of Olive, the Other Reindeer. 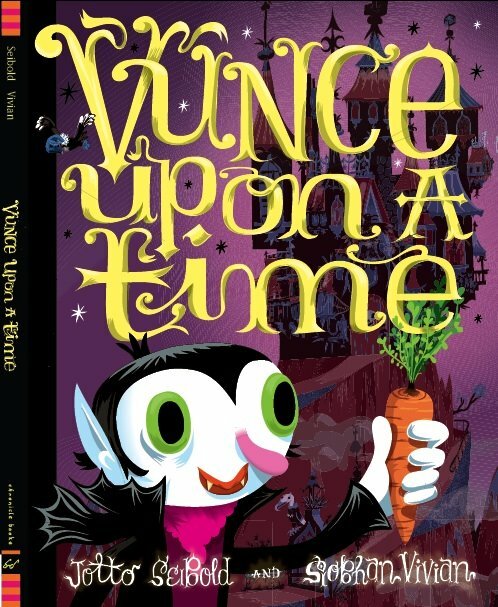 Vunce Upon A Time is all sorts of adorable. This unique picture book pairs Siobhan Vivian's brilliant illustrations with a story from one of my favorite authors, J. Otto Seibold. If you haven't had a chance to dive into any of Siebold's other stories I'll give you a quick sum up. They are always quirky, always adorable, and always something you won't find anywhere else. That's why I was so excited to meet Dagmar! Dagmar's story is short and sweet. He's a vampire who just so happens to be a vegetarian! However, despite his love of leafy greens, his all time favorite snack is none other than candy. Happily, Halloween just so happens to be the perfect time to get tons of free candy! This story follows Dagmar as he tries to figure out how to make his Halloween night a big success, without running into any scary humans. What is one little vampire to do? Reading a book to kindergartners is always a worry for me. It has to hold their attention really well or they'll be antsy within minutes. Dagmar didn't disappoint! They fell in love with his silly story, and were extremely amused that he was afraid of humans. We had a great discussion about what being a vegetarian means, and even tied it in to learning about different types of vegetables. I would have liked to see a little more mention of that topic in the story, but it was just as adorable as is. After all, Halloween is all about the candy. The illustrations are really what brought the story to life. Vivian's illustrations pop off the page and brought forth quite a few giggle sessions from the kids. The pages where Dagmar was debating on a costume had them howling with laughter! If I had to sum this book up in three words: fun, unique and cute. 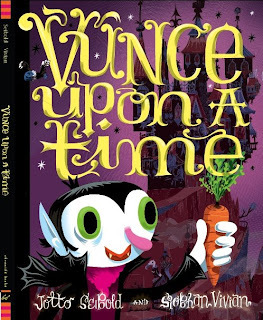 Never before have I met a vegetarian vampire, but Dagmar is definitely my kind of storybook character! I look forward to more of his adventures and I know that my kids do too! 2012 Standalone Reading Challenge - Joining up! Library Loot: First visit in November! An interview and giveaway with Victoria Simcox! Ready for an early Christmas present? Are you a Sherrilyn Kenyon fan?